Add a little holiday “spirit” to your usual cheese spread with my Drunken Goat Cheese Log. 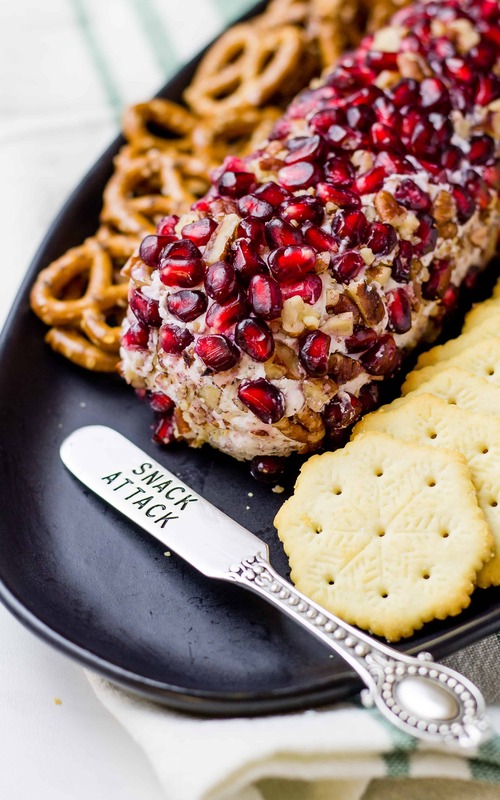 Creamy goat cheese, toasted pecans, and tangy vodka-spiked pomegranate arils! What do you do when you have too much cheese for a cheese ball? You CAN make two cheese balls OR you can combine them and make one glorious cheese log. This is a great idea if you are going to a party that has a lot of guests attending and you don’t want to make two different dishes. I am fanci-fying my cheese ball with fresh rosemary from a bush that I didn’t even know I had, some of my buttery toasted pecans, and juicy pomegranate arils. You might be wondering why it’s called a Drunken Goat Cheese Log. I can tell you that there is a little vodka in this goat cheese log, but not where you think it might be. Just take me to the DRUNKEN GOAT CHEESE LOG Recipe Already! If you’d rather skip my (very helpful, I think) tips and tricks, essential cooking info, and similar recipe ideas – and get straight to this delicious easy DRUNKEN GOAT CHEESE LOG recipe – simply scroll to the bottom of the page where you can find the printable recipe card. Let’s start with a traditional goat cheese log. You can buy packages of goat cheese in the store already seasoned with herbs and other such things but I prefer to get the plain goat cheese and add my own flavors and spices. Buying plain is also helpful if you have allergies to certain nuts and herbs, or you just want to control the level of spice and salt. The added herbs and spice rubs in the pre-seasoned goat cheese can contain a lot of salt because it’s cheap. The plain option is always best. I keep this goat cheese log simple with rosemary, toasted pecans, and a little tart action thrown in in the form of pomegranate arils. I tried a few pomegranate de-seeding methods when I made my Pomegranate Gimlet and the “submerge in water and pick them off” works best for me. The “hit the back of a pomegranate half with a wooden spoon until they all fall out” is less messy but it is SO time-consuming and I always end up hitting my hand in the process. You can buy the arils by themselves in the produce section, although be prepared to spend your entire paycheck on them. To get this goat cheese log a little tipsy I sneak the holiday “spirit” into the arils themselves. The night before you serve the cheese log, place the arils in a food storage container. Pour in enough vodka to just cover the arils and let them sit overnight in the refrigerator. The next morning, you will have some intoxicated pomegranate arils on your hands! Remove the arils from the vodka and dry them off so they don’t get too drunk and burst. When you remove the arils, don’t toss the vodka! Save it as you now have homemade flavored vodka for a cocktail that you can enjoy while you are rolling the cheese log. Drink up! The drunken arils add a little bit more to an otherwise basic goat cheese log. Not only is it long enough (lol) to feed a large group but there are so many things going on flavor wise! I love that the goat cheese is pretty mild which makes the addition of the fresh rosemary really stand out. 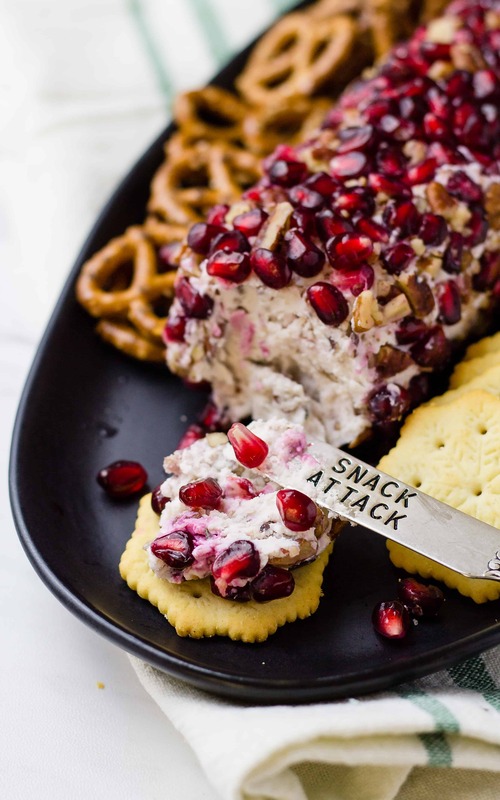 Goat cheese is very creamy so the addition of the crunchy pecans adds texture and the pomegranate arils add not only a hint of vodka but a splash of tart juice when you bite into them. I have to admit that I peeled and seeded 5 pomegranates and have a stash of arils in my fridge. I had to mark the drunk ones with an “X” so the kids won’t eat them. They have made their way into my granola, yogurt, and even my salads the last couple of days. 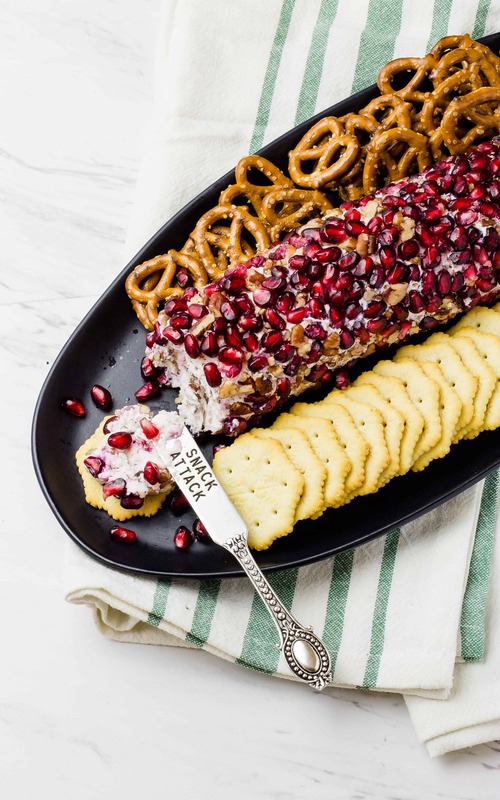 I hope this Drunken Goat Cheese Log with tipsy pomegranate arils is the highlight of your holiday party! 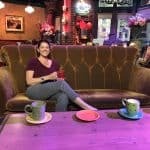 Q: How long do you have to soak the arils? A: They are nice and spiked after 4 hours but I prefer overnight. Q: Can I use a different spirit than vodka? A: I love this with tequila too! Q: How far in advance can you roll the goat cheese log in the arils? A: I wouldn’t roll it more than 4 hours in advance as the arils can start to pop and leak out the juice. Q: Can I freeze the goat cheese log? A: I would not recommend it as the goat cheese can get grainy and the arils will pop. What is your favorite cheese log or cheese ball to serve during the holidays? I hope your new answer is this Drunken Goat Cheese Log! 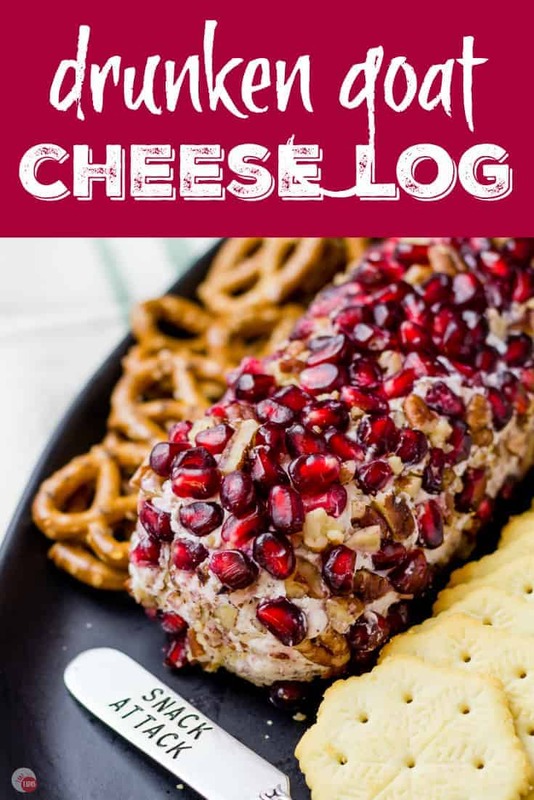 If you love this Drunken Goat Cheese Log Recipe as much as I do, please write a five-star review in the comment section below (or on Pinterest with the “tried it” button – you can now add pictures into reviews, too! ), and be sure to help me share on facebook! 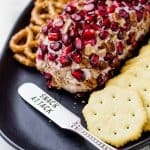 Add a little holiday “spirit” to your usual cheese spread with my Drunken Goat Cheese Log! Creamy goat cheese, toasted pecans, and juicy vodka pomegranate arils! Remove your pomegranate arils from the pomegranate or buy them already removed. Place in a food storage container. Add enough vodka to cover. Seal and place in the refrigerator overnight. When ready to use, drain off the vodka (SAVE IT FOR A COCKTAIL) and dry the arils on a paper towel. Mix together the goat cheese, cream cheese, rosemary, and salt. Fold in 1/2 cup of chopped toasted pecans and 1/3 cup of the drunken pomegranate arils. Shape into a log and wrap in plastic wrap. Chill in the refrigerator for 30 minutes to or until ready to serve. 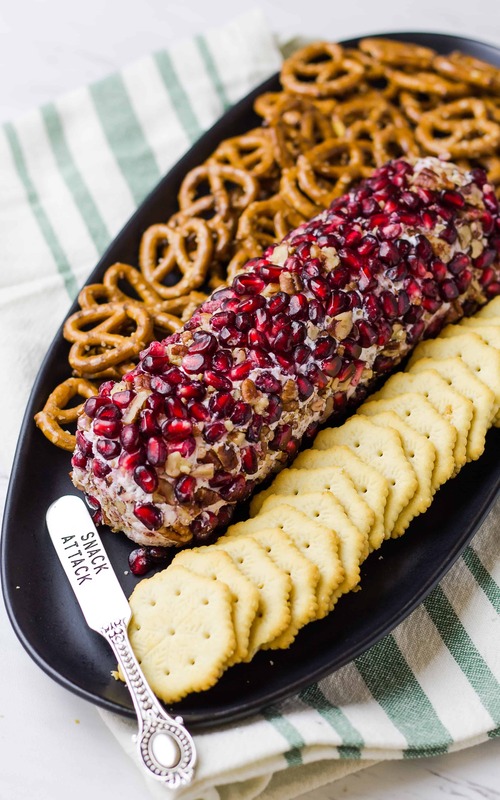 When ready to serve, remove the plastic wrap and roll the goat cheese log in chopped pecans and drunken pomegranate arils. Serve with crackers, pretzels, or bagel chips. I made this appetizer for our Christmas Euchre party! It was delicious and gone! it looks so fancy and the taste is amazing but it is really easy to make! A winner in my book and I will be making it again! Thank you! That title just sounds funny. Goats are funny anyway. I love what you’ve done here. This cheese log is so pretty and dressed up for the holidays. Those pomegranate seeds are the perfect contrast to the goat cheese too.